The ideal home inspection should be clear, comprehensive, and completely unbiased. After all, Isn’t it crucial to know as much as you can about the condition of a home before you buy or sell? This is what MORRIS INSPECTIONS ensures to every single one of their clients. We welcome you to Inspect alongside us, offering you the experience of seeing your home through the eyes of a professional home inspector or you may join us at the end for a summarized review of the property. It’s your inspection and home buying journey you decide what best suites you. By working with us you’ll get the information you need, your questions answered and a heads-up on what might need maintaining or replacing in the future. Unable to attend, no problem. We will contact you immediately after the inspection and give you the straight goods. Either way you will have a report emailed to you usually within 24 hours but quite often that same night. We don't stop there, for as long as you own the home we are here to help! Don't hesitate to call with questions. That's what we are about good old fashioned service for a straight up price, with Inspections starting at $250. Don't like surprises? neither do we. That's exactly why a Pre-Listing Inspection is just good business. Put your best foot forward and be proactive, have the opportunity to deal with any potential issues the Buyer's Inspector will most certainly find. Give your Real Estate Professional the information they need to price and market your property properly and approach the market with confidence. This will help you avoid the dread 11th hour renegotiation, or worse,that you no longer have a deal. Our Pre-listing Inspections are exactly the same as a Pre-Purchase Inspection. No short cuts, "no stone left unturned" just good business. Your search has been arduous and emotional. With so much weighing on your mind probably the best decision you could make is having a Professional Home Inspector assist you through this stressful time. We will provide you with a much needed "pause" for an impartial, candid evaluation of the home and its many systems. Our approach is to ensure your future home is safe, warm and dry; not only pointing out the potential problems but to highlight the positive aspects as well. After our inspection you should be well armed to approach your decision with confidence,remember we are just a phone call away if you need us. Infrared cameras are devices that can be used to project the temperature of objects into a visual image. People often think of them being used in search and rescue situations, where a person’s body heat makes them easily visible as a infrared thermal image, but they can also be extremely useful when in the hands of a professional home inspector. A professional home inspector can use the images generated from the infrared camera to detect anomalies that may otherwise be invisible or concealed, such as missing or damp insulation, moisture intrusion or condensation, plumbing leaks and electrical issues. 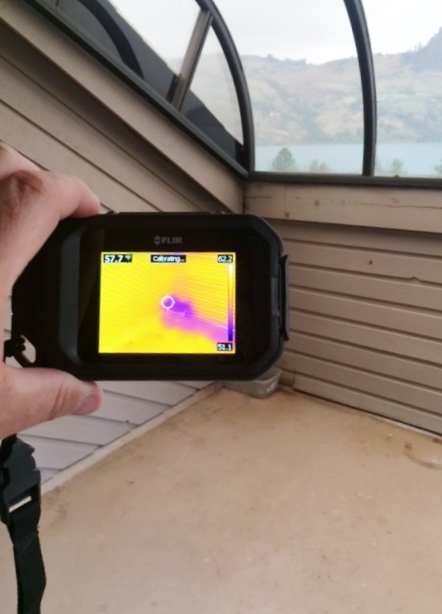 Infrared cameras are a fairly new technology in the home inspection industry that can help detect the type of significant problems that were often missed in the past. Not all home inspection companies use infrared technology in their services,others charge a premium. At Morris Inspections we use infrared cameras in all our inspection services at no extra cost to our clients. We think that any home inspection that excludes an infrared scan is incomplete,and may have an increased potential for undetected deficiencies.To us charging extra for this service is just plain wrong.